I gave an interview to Nissan today about the first year experience with the Nissan LEAF. Because I never manage to say everything I want to say out of the top of my head, I decided to write down what I really wanted to say. It’s not really a transcription of the interview, just an after thought of jotting down of what I said (or forgot to say). Q. How many Km have you driven so far? What is your daily commute like? A. I’m very close to hitting 22,000 Km (21,900 Km right now), with a daily commute to work of 34 Km. Q. What excites you and your family the most about driving an electric car? A. My son turned 16 a few months ago and the first car he drove in his life was an electric car. It’s the next generation and I’m really proud that everything he drove so far, he did it without burning a single drop of fossil fuel. Q. How has driving electric changed your life? A. We use the Leaf for 80 to 90% of the time so our second car needs very little gasoline, which reduced our gas fill-ups to less than once a month. We no longer have to worry about wild fluctuations of gas prices, specially before long weekends, and we’re happy that we’re supporting the development of technologies that help the environment, instead of an old industry that is destroying it. Also, the money we spend on electricity supports our local utility company. It stays in the region instead of going to other provinces or even other countries. The Leaf is also very energy efficient and uses electricity that is widely available overnight so we’re glad we’ve been able to significantly reduce our carbon footprint on the planet. Q. What features do you like the most on your Leaf? A. I basically like everything but I can tell you what friends and family who drove our Leaf like the most. Number 1: The silence, the lack of vibration, the car of the future feeling. Number 2: The heated steering wheel. I’m serious! Q. How real is range anxiety and how have you managed it this past year? A. It lasted a couple of weeks until I got to know what the car could or could not do. I remember not going on a 100 Km trip because I was afraid I couldn’t make it, and later doing the same trip without any issues. I work at IBM Canada, who’s a big supporter of electric vehicles. The ability to charge at work gives me the piece of mind. My charge going home at the end of the day is the same charge I had early in the morning so concerns about range rarely come up. I could still make it back and forth by charging at home only, but charging at work really took the range anxiety issue off the table. That’s why it’s so important for employers, businesses and local government to work together and promote the deployment of more charging stations and public charging infrastructure. Q. What was the longest trip you’ve taken with your Leaf so far? A. 300 Km to Kingston and back, recharging at the Ambassador Hotel overnight. Q. 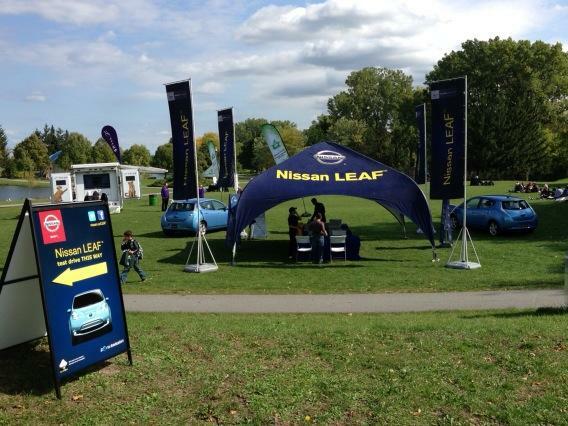 What is your most memorable road trip with the Leaf? Q. How much money have you saved since you began driving electric and what have you done with it? A. It depends on which car I compare with. If I compare it with our second car, a compact sedan, we have saved over $2,000 on gas, oil changes and insurance premiums (it’s 20% cheaper to insure the Leaf). If I compare with the car I used to drive to work (a minivan), then the savings jump to well over $3,000. In one year! These savings were enough to purchase a set of winter tires, and a good quality roof rack and cargo box for camping. Q. What is the reaction of people when they find out you drive an electric car? Q. Do people ever stop to ask you questions about your car? Q. What surprises you most about people’s understanding of electric cars? A. There’s still a lot of misinformation out there so I expect people to be confused. When they come and ask me questions, they’re mostly surprised I can drive more than 150 Km on a single charge. They expect much much less, so they end up realizing an electric car can easily fit their typical day. Q. What is your advice to those who are contemplating buying an Electric Car? A. If you’re a family with two cars, like our family, it’s a no-brainer. One of your cars has to be electric. You will use it most of the time, to go to work and to do most of your errands, while still having the other car available for longer trips. It’s the best of both worlds. The savings in gas alone will easily pay the initial investment in a few years. And driving electric is a whole new and gratifying experience.